Updated November, 2017. This white paper provides an unbiased review of AutoStore which is relatively new automated material handling solution being sold and serviced by Swisslog, Dematic and Bastian within North America. 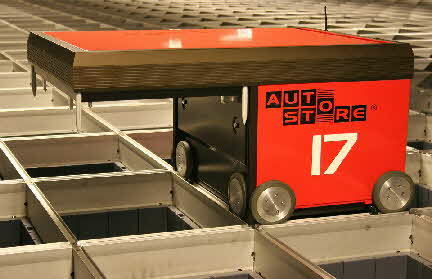 AutoStore is one of the more interesting solutions for semi-automated storage and retrieval of split case products. AutoStore is a flexible goods-to-man system that is highly effective at maximizing labor productivity, order accuracy and space utilization. Due to Amazon's acquisition of Kiva Systems in March, 2012, we believe that there will be a strong emerging market for automated goods-to-person and goods-to-robot material handling solutions, particularly for solutions that are flexible and scalable by design. AutoStore is truly a different concept that we believe will emerge as a strong contender for this market. The intent of this article is to help your company better understand if AutoStore provides a good fit for your distribution operation. MWPVL International has reviewed this article with solution providers to ensure its factual accuracy. Any opinions expressed within this article are strictly those of the author. AutoStore is a technology that was originally invented during the 1990's in Norway by a company called Jakob Hatteland Logistics AS which operates operates as a subsidiary of Hatteland Group. The company originally invented the solution to handle their own storage and retrieval needs for electronic components to support a manufacturing assembly operation. In 2011, AutoStore won a prestigious award at LogiMAT for "Best Product" in the "procurement, transport, storage" category. Rather than sell direct to end-customers, Hatteland launched AutoStore through a global network of distributor partners. In January 2011 Swisslog AG signed a contract for AutoStore distribution on a global level. As well, Lalesse Europe services the Benelux countries; Element Logic AS and Quibiqa AS distribute to the Nordic countries; Quibiqa AS services the UK; and AM Automation GmbH distributes AutoStore in Germany. In North America, Swisslog, Dematic and Bastian Solutions are system integration partners of AutoStore. 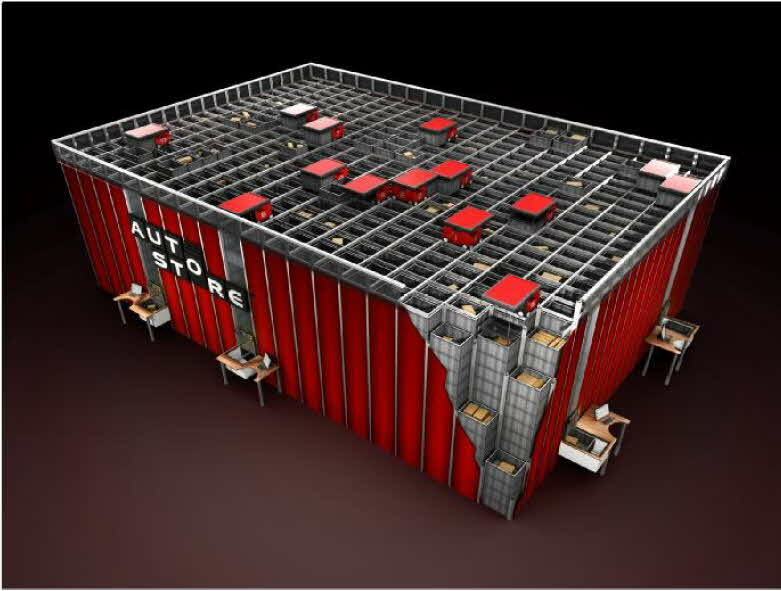 The best way to explain AutoStore is to imagine a giant erector set that rises vertically from the warehouse floor in column stacks that are shaped to the size of a standard storage bin (internal measurement of 400mm wide x 600mm long x 310 mm high ) (15.75" wide x 23.6" long x 12.2" high). Note that bins are also available in a shorter 220 mm (8.6”) height size for heavier or smaller SKUs. Each vertical stack of bins can rise up to a maximum height of 16' (4.9m) such that each stack can store up to a maximum of 16 bins. The vertical stacks are adjacent such that they form a grid that can easily expand along the X and Y axis as much as is needed to store the required number of bins within the system. Hopefully by now you can picture thousands of bins stored 16 high in a dense grid of adjacent stacks that have no operating aisles whatsoever. Basically think of this as one big dense cube of storage where each vertical stack can store up to 16 bins high; and whereby each bin can store one or many SKUs subdivided within the bin. The size and shape of the grid can be adapted to any existing facility and can even work around building columns. To store and retrieve the bins, a set of robots move horizontally along a rail grid that resides on the top surface of the self-supporting storage system. Each robot is equipped with 8 wheels so that 4 are used when traveling along the X axis and the other 4 are used when traveling along the Y axis. The mobile robots themselves are not that big - they have similar dimensions to the bins being stored. Each robot is equipped with an extended hoist apparatus that vertically lifts bins from within each vertical stack to the top of the grid. The robot itself stays on the aluminum grid rails at the top of the modular storage cube. The robot's hoist has a set of 4 steel bands that descend into the vertical stack to "grab" the topmost bin within the stack. The best way to truly understand the concept is to click here to see a video that visually explains the concept. Bins are all mixed up together throughout this storage cube so how are they retrieved and presented to an operator for the purposes of fulfilling an order. To accomplish this, a robot is directed to travel to a vertical stack of bins to retrieve the required bin that is stored within the stack. The robot then hoists bins out of the stack one at a time until it reaches the bin that is required. Thus the worst case is that there may need to be 15 bins extracted from the stack to access the 16th bottom-most bin (more on this later). The required bin is extracted from the stack by the robot hoist which elevates the bin to the rail grid at the top of the storage cube. The robot then moves the bin horizontally to a "drop" stack based on the order picking station where the bin is required for order picking. The bin is then lowered by the hoist bands down to ground level where it is then presented to an operator at a picking work station. Upon confirmation of completion of picking, the robot then elevates the bin back up to the top of the storage cube and the bin is subsequently returned into storage. This process repeats itself every time there is a request for inventory from a picking work stat ion. By now the skeptical thinker is thinking about the pitfalls of this solution and several questions immediately come to mind. How long does it take to "dig out" 15 bins from the stack every time the bottom bin is needed? What happens to the 15 bins that were extracted? How long does it take to present a new bin to the order picker? Where does the bin get returned to after it has been picked from? What happens if fast moving SKUs are stored at the bottom of the stack? Can multiple robots work together to speed up the storage and retrieval of bins? Are there risks associated with storing so much critical inventory buried in a storage environment that is inaccessible by humans? These are all very valid questions so let's tackle them one at a time. The most important concept to understand is that this is a self-optimizing system by virtue of the fact that bins are always returned to the top of a stack after they have been picked. Imagine for a moment that a bin is at the bottom of a stack (i.e. position 16) and inside the bin there is a new SKU that was introduced earlier today. Furthermore, let us say that we have no idea if this item will be fast or slow in velocity (i.e. order lines). The first time there is a request for this item, the robot will need to burrow into the stack to remove the first 15 bins in order to retrieve the bottom-most bin that holds our new item. This process takes roughly 3.5 minutes to complete. During this process, multiple robots can work together to store the 15 bins that have been extracted, almost like wolves working together in a pack. The actual bin extraction process is done with a hoist that essentially uses 4 rollup steel bands (18 gage 1" wide) that are attached to a bin lid. The bin lid descends down the stack and grippers are activated when the lid touches to topmost bin in the stack. The bin is then pulled up the column stack to the top of the storage cube. Each robot is equipped with a gridline sensor on the underside of the unit located near the wheels. As the robot travels throughout the grid, the sensor detects its location which is communicated via wireless controls to the Warehouse Control System (WCS) which knows the real time location of every robot. This is how the WCS manages the overall traffic flow of the robots. Once the bin with our requested item is extracted, an available robot transfers the bin to the required pick station. Upon confirmation of pick completion, the robot elevates the bin back up to the top of the storage cube. The robot then returns the bin to the top of an available stack. It is important to note that the bin is not returned to its original storage location, rather it is returned to the top of an available stack. The next time our new item is requested, the bin is now at the top of the stack hence the more frequently an item is ordered, the higher the probability that its bin will be positioned at the top of a stack. This design philosophy ensures that it is only on rare occasions when the robots need to access a bin that is at the bottom of a stack. Theoretically, if 80% of the order line activity is associated to 20% of the SKUs, then the top 2-3 vertical layers within the stack will be accessed 80% of the time. If 10% of the SKUs generate 90% of the order lines, then 90% of the order lines will be accessible from the top 1-2 bins in each stack, and so on. In fact, case studies from the field indicate that 90% to 95% of all bins being picked are from the topmost 3 layers. In other words, over time slower moving bins will quickly descend to the bottom of each stack and faster moving bins will continually percolate to the top of the stack. This design simplicity is what makes the AutoStore system is so interesting and powerful! The need to spend time on slotting is virtually eliminated because the system is continuously self-optimizing! The warehouse control system controls the movement and actions of all robots in the grid. The robots are requested to perform a function in advance of when they are required at a picking station. For example, if the retrieval time for a bin is known to be 3.5 minutes (worst case), then the robot is sent out to do this work 3.5 minutes before the bin needs to be presented at the order picking station. As such, the speed at which the operator works is what drives the overall design of the AutoStore system. Let us say that the goal is to minimize operator dwell time. In this case the objective is to present bins to order pickers as fast as they are capable of comfortably and accurately performing their job functi on. The order picking stations can be designed to have up to 3 adjacent bin presentation positions such that 3 bins are continuously being presented to the operator at any given time. This simple work station design helps to eliminate the possibility of operator dwell time due to the lack of a bin. The number of robots working at the top of the storage cube can be increased as needed which implies that AutoStore can manage peak fluctuations in shipping volumes without any hard constraints. Many companies that operate automated systems have to remove faster moving SKUs from the automated material handling system during peak season to prevent overload. With AutoStore it is quick and easy to increase picking work stations and robots to support peak volumes (ed. note: of course this comes at a cost). Generally speaking, order pickers work multiple orders simultaneously such that a batch of say 9 orders is active at a work station at any time. The operator picks the SKU/quantity from the presentation bin and then puts this to the correct order container with the assistance of pick to light to ensure overall accuracy. It is important to note that presentation bins can be subdivided to hold multiple SKUs which is key for smaller slow moving SKUs. If order pickers need to perform any other activities at the work station (e.g. value added services or packing functions) then the order picking rate is reduced and the required bin presentation rate is reduced as well. Other work tasks to consider include the need to scan each item to capture data such as bar coded lot numbers. Each required work task consumes seconds of time that impact the AutoStore design criteria. If the bin has been sub-divided into multiple SKUs then one of the 9 orders being batch picked may require more than one SKU from the bin. If the operator batch picks 9 orders at a time, then any of the 9 orders may require the SKU stored within the bin. Thus the notion of batch picking significantly increases the chances of obtaining multiple "hits" from a single bin presentation. According to Swisslog, the actual pick rate from AutoStore for “heads down” picking applications is typically in the range of 600 - 1,000 lines per hour. To put this into perspective, in most distribution centers where static bin shelving is used to store slow moving split case SKUs, the typical pick rates are in the range 75 - 110 order lines per hour. Of course this rate is different for each firm and depends on many circumstances, but this provides a fairly typical pick rate in a traditional conventional warehouse where split case slow moving SKUs are stored in static shelving units. There is a labor penalty that needs to be considered which happens at the time of receiving. In a conventional warehouse, the receipt of a vendor purchase order that contains a high variety of slow moving SKUs is typically checked in, sorted, and then putaway directly either to reserve or pick bin locations. The only time the receiver needs to open an inbound carton is if it contains multiple SKUs, or if an inspection process is required. The individual selling units are generally not touched unless required. With the AutoStore system, every SKU that is being stored within the AutoStore environment needs to be handled at the unit level. Each inbound carton is typically opened such that the units are then placed into a standard bin. Thus the "touch labor" requirement at the time of receiving is higher and serves as a minor labor penalty that needs to be determined as part of the ROI calculation. Having said this, the typical approach is to transfer the bins to the AutoStore conveyor as a batch of many bins either on a pallet or by conveyor. The bins are then injected into the storage cube by inserting them via one or more receiving stations at which time the robots take over for the actual putaway work. Thus there is a major time savings associated to the inbound putaway effort since the travel time and labor hours spent putting slow moving inventory into shelving bins is eliminated. In many distribution centers, such as automotive aftermarket facilities, for every two outbound order lines, there is one inbound order line. Tens of thousands of parts are so slow moving that they are purchased in steady state unit quantities to replace inventory as soon as a unit is sold to a customer. Thus the labor hours to putaway inventory is a significant component of the labor budget and AutoStore helps to eliminate many of these hours. Lastly, there is the issue of commingling and burying thousands of SKUs into a big storage cube. What are the risks associated of not being able to access this inventory in the event of a system shutdown? For starters, this is purely an emotional issue. It is an issue that all companies have overcome when deploying any type of automation that prevents goods from being accessed in the event of system failure. Almost every AS/RS pallet system falls into this category. The reason is that this is a non-issue for AutoStore is by virtue of the fact that a breakdown does not occur for the entire system, rather for a component of the system. For example, if a robot breaks down and needs to be maintained, then it can be shuttled over to a sick bay for repairs and a redundant robot can take over the work. The system involves very few moving parts which means that the downtime being recorded from the field is next to nothing. In our opinion, the belief that it is necessary to have inventory touchable by human hands is purely an emotional fear that can easily be overcome by talking to companies that have already blazed the trail. Which Companies Are Buying Into AutoStore? To date, the companies that have invested in AutoStore are primarily in Europe which comes as no surprise since land costs and labor costs tend to be higher in these markets and AutoStore provides strong financial benefits in both of these areas. As at 2012, a total of 16 systems are up and running in Europe with another 4-5 on order. Swisslog is also starting to see strong interest in the United States where there is an emerging market for semi-automated material handling solutions, particularly for split case picking environments. A number of the Scandinavian projects listed below have been installed by Element Logic which is a systems integrator based in Norway. Elotec is a manufacturer/supplier of fire-alarms, emergency lighting and camera surveillance headquartered in Oppdal, Norway. The company was the first to implement AutoStore in 2004 with 6,000 bins, 5 robots, and 3 picking stations. GNT is a distributor of computers and computer components with operations throughout Scandinavia. 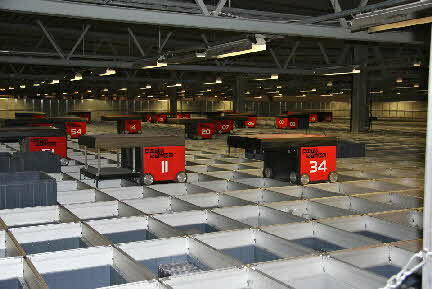 In 2005 the company implemented an AutoStore system comprised of 11,800 bins, 14 robots, and 7 work stations. Tingstad (Subsidiary of KoppernæsGruppen) is a leading supplier of fasteners and tools for mechanical industry, construction, shipyards and shipowners and power industries. The company has installed AutoStore in its central warehouse in Ålesund and also in its Oslo warehouse. The systems include 12,800 bins and 6,2000 bins respectively. Projectiondesign is a Norwegian company that manufacturers high performance projectors that deployed AutoStore in 2008 with 8,400 bins, 5 robots and 4 picking work stations. The company was seeking a compact solution that is quick to implement, flexible, scalable, ergonomically adapted workplaces, as well as being a precise, dust-and ESD-safe storage and retrieval system for the production. Otra Norge AS is a distributor of electrical components based in Drammen, Norway. The company implemented AutoStore in 2008 with 10,400 bins, 10 robots and 5 picking work stations. A video of this operation can be seen here. Komplett ASA is a leading $600 Million Scandinavian Internet retailer delivering PC components, PCs and other related electronic equipment to consumers and companies throughout Norway, Sweden and Denmark. The company upgraded its 25,200 m² (270,000 sq. ft.) distribution center in Sandefjord, Norway with a deployment of the AutoStore system in 2008. In 2010, Komplett prepared and shipped 1.4 million orders and nearly 4.3 million order lines through the AutoStore system. Komplett's system consists of 33,700 bins, 55 robots and 14 robots. The system deployment increased overall productivity by 30% and increased warehouse storage density by 60% as compared to the previous conventional environment. Today, the company processes 80% of its outbound order lines through AutoStore using 10 employees per shift x two 8-hour shifts per day. Hattelco is a B2C/B2B distributor that is among Norway’s leading suppliers of computer related products, Before, implementing AutoStore, employees would walk 10-12 km/day over several floors to pick orders. The time to pick orders was reduced from several hours to several minutes. The company installed 9,700 bins, 15 robots and 6 work stations in their facility in Arendal, Norway. Vestas Wind Systems is the world's largest manufacturer of Windpower. The company manufactures control cabinets for wind turbines in Lem, Denmark and in 2008 they implemented AutoStore. They now perform 80% of their order picking lines from 8.5% of their total floor space. The system is comprised of 5,200 bins, 10 robots, and 6 picking stations. Onninen AS is is a supplier of products and services for electrical and plumbing that implemented AutoStore in 2009. The company moved to a new 161,400 sq. ft. distribution center in 2010 in Skedsmokorset, Norway of which AutoStore occupies about 7,500 sq. ft. Roughly 65% of the total 6500 - 7000 daily order lines are picked through AutoStore. The company claims that AutoStore provides better stock control and that efficiency has greatly improved. Human resources for picking small goods has been halved and the number of temporary warehouse workers reduced from 24 to 2. The system is comprised of 27,600 bins, 24 robots, and 10 picking stations. XXL deployed AutoStore to distribute sporting good items in 2010 at their distribution center in in Gardermoen, Norway. The system is comprised of 21,000 bins and 10 robots with 4 pick work stations. XXL is Norway’s third largest sporting goods retailer with 14+ stores in Norway and Sweden. Antalis AG is a European paper and packaging material distributor and logistics service provider. Antalis is Swisslog’s first Swiss customer to use AutoStore to increase efficiency and minimize space requirements for published materials storage at its main depot in Switzerland. Antalis reportedly chose AutoStore because of its scalability, flexibility and ease of integration into the existing infrastructure which is a building from the 1800's. The system will be installed in 2012 with 18,000 bins, 10 robots and 4 picking stations. AVNET Logistics, a subsidiary of AVNET Inc., is the world’s largest distributor of semiconductors, connectors and passive, electro-mechanical and electronic system components. In February, 2011, AVNET deployed AutoStore in a new distribution center in Poing, Germany (near Munich). In the first phase, the system handles 35,000 SKUs stored in 45,000 bins in a footprint of 1 100 m² (11,840 sq. ft.) of warehouse space. A total of 37 robots store / retrieve goods and transport 680 bins/hour to 16 picking stations that output about 1,000 lines/hour. Plans call for a picking volume of 5,000 order line items per day as well as 2,000 line items from receiving. Competec is Switzerland’s largest electronics distributor. The company is building a new 55 000 m² (592,000 sq. ft.) electronics distribution center to support importing, distributing and selling hardware, software and entertainment electronics. Swisslog is deploying an AutoStore system that is at the heart of this facility which is largest electronics distribution center in Switzerland. In the first phase, the automated bin system will encompass 62,000 bins in 2,500 m² (26,900 sq. ft.). The grid will contain 100,000 bin locations and 25 ports for retrieving and storing goods using 70 robots. The facility is expected to go into operation in the spring of 2012. Stormberg is a leading Norwegian supplier of sports and leisure wear. The company implemented AutoStore in June 2011 and now handles 80% of all picking through the system in 30% of the space previously required. Stormberg claims to have doubled throughput capacity without having to hire more warehouse staff which has significantly reduced their cost per order line. In February, 2012, Medline Industries, Inc. commissioned Swisslog to install AutoStore into one of their existing distribution centers by the end of the year. Medline is the largest privately held medical supplier in the United States. The company manufactures and distributes over 125,000 medical and surgical products to healthcare institutions and retail markets from a network of 30 distribution centers. This project represents the first roll-out of what will be implemented at multiple locations. The first site will be comprised of 20,000 bins expandable to 40,000 bins, 35 robots and 12 picking stations. In April, 2012, the supermarket retailer Asda contracted with Swisslog to deploy the largest AutoStore installation to date, over two phases, at its 92,900 m² (1,000,000 sq. ft.) Lutterworth, Leicestershire, U.K. depot. The system will be comprised of 70,000 storage bins and 160 robots, linking eight ergonomic decant stations with 12 goods-to-man picking ports. Asda is the 2nd largest supermarket chain in the UK (17.9% market share) and is owned by Walmart. Asda services 550 stores across the UK with more than 35,000 products including groceries, clothing, household goods and electronics. What is the Cost of an AutoStore System? Swisslog does not publicly disclose system pricing as they only market it as a turn-key solution which is unique to each client, therefore for the sake of this article, we provide some approximate figures for planning purposes only. It is important to note that this information is based on our research and has not been confirmed in any way by Swisslog. An entry-level starter kit is in the range of $1 Million which would suffice for a small spare parts distribution operation. A system that includes 50,000 bins in a 1,200 m² (13,000 sq. ft.) footprint; 1 standard receiving station; 2 multi-order pick stations with pick-to-light; and 2 - 8 robots costs in the order of $US 3 - 5 Million depending on throughput rates and I.T. interface requirements.. This figure includes the costs for: the grid structure; the bins; the work stations; robots; chargers; all necessary control software and hardware; installation; and project services. This figure excludes: conveyors that may be used to transport goods into or out of the AutoStore system to other areas of the distribution center; software customizations and/or interfaces to other systems; permits; taxes; and duties. 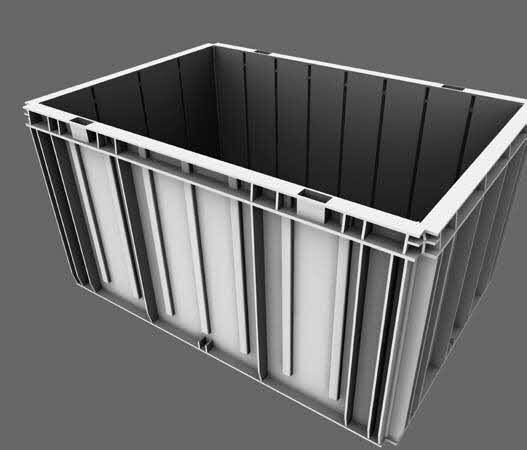 A system of this profile could potentially be used to store 100,000 SKUs if the bins are sub-divided to an average of 2 SKUs per bin. Assuming an average rate of 9 order lines per bin presentation and 150 bin presentations/hour, this system could yield an output of 20,000 order lines over 2 operating shifts. Clearly a larger system that needs to drive more throughput volume will require more robots which is where the cost of this technology starts to increase. The key point here is that it is important not to shave costs by reducing the number of robots required to support the distribution operation, as this could have an adverse impact on operator dwell time which was discussed earlier. Why Are Companies Buying AutoStore? The AutoStore system infrastructure is flexible and scalable because it is modular by design. Like the erector set, AutoStore is assembled and disassembled by snapping together standard components that make up the grid of self-supporting vertical stacks. The parts are straight forward to assemble and take apart and they can be installed around building columns. There is no need for sprinkler systems, heavy electrical requirements or complicated building requirements. Because the infrastructure is independent of the building and disassembly is a quick process, AutoStore can be easily moved from one building to another without painful business disruption. This is an important consideration when evaluating any type of automation solution. We see this as being very attractive to Internet retailers that are experiencing unpredictably high growth rates and find themselves relocating to new facilities as a result. Most mechanized and automated material handling systems for split case products involve major infrastructural investments that are expensive and disruptive to redeploy into another facility. The AutoStore system is flexible to operate because it never needs to be shutdown. The robots are battery powered and self-monitoring. When a robot requires a battery power charge, it simply advises the warehouse control system and proceeds to a designated charge station where it receives a 5 - 10 minute opportunity charge before returning to service. The typical robot uptime per day ranges between 20 -22 hours and battery lifetime is typically in the range of 3 - 5 years. Batteries are a consumable item and the cost of replacement needs to be factored into the overall ROI analysis. As discussed earlier, AutoStore can potentially increase order picking productivity by a factor of 5X - 10X over conventional environments. This is primarily due to the elimination of travel time since this is a goods to person system. The same principle holds true for travel time savings associated to putaway and storage labor. As discussed earlier, it is not uncommon for every two outbound order lines to equate to one inbound order line in a split case environment. Thus there is an important time savings associated with eliminating travel time required to store goods into static bin shelving. The labor savings calculation is unique for each operation because there are many variables at play. Suffice to say that it is advisable to investigate this thoroughly up front when developing the ROI analysis for this solution. AutoStore enables a typical space reduction in the order of 60% when compared to storing slow moving SKUs in static bin shelving. This is an important consideration for distribution centers that are land-locked and that are fighting for capacity to handle sales growth. For example, let us say that a company has 100,000 SKUs of small components that can be fit into 50,000 AutoStore bins. In a traditional static shelving environment, assuming that a typical static shelf (4' wide x 2' deep x 8' high) holds 65 SKUs per bay, one requires 1,538 shelving bays x 14 sq ft per bay = 21,532 sq. ft. (assumes no cross aisles and operating aisles of 36" width). For this same application, AutoStore consumes a 1,200 m² (13,000 sq. ft.) footprint therefore the space savings is exactly 60.4%. 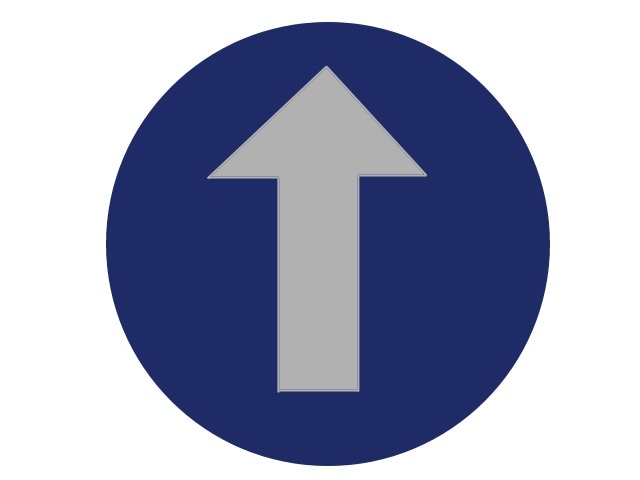 AutoStore is not a floor-level operation that makes poor use of overhead space. The system rises to a height of 16' and there are no operating aisles which provides for great storage density. Increased order accuracy, order fulfillment rates and speed of order turnaround time. In a conventional distribution center where traditional human-based picking systems are in use, the best picking error rates range between 1 - 3 units per 10,000 units picked with more typical error rates being in the range of 1 - 3 errors per 1,000 units picked. In distribution operations that are paper-based, accuracy rates are generally lower than this. To compensate, companies will build in a redundant detailed order checking process that adds cost to the operation. AutoStore enables the highest levels of perfect orders because picking stations are designed with pick to light technology to help the operator put product into the correct order container. 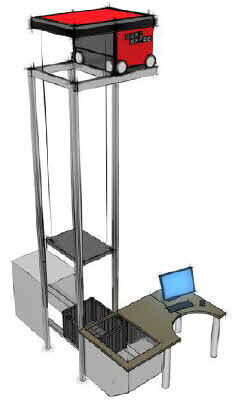 As well, bar code scanning verification and automatic weight validation can be used to detect SKU / quantity mis-picks. Order fulfillment rates, which are sometimes referred to as scratch rates, define the number of units not shipped out as a percentage of the total units shipped. In a non-automated distribution center, scratch rates can vary depending on the type of technologies in place to enhance inventory accuracy, but it is not unusual to have 1 - 3+ scratches per 1000 units shipped. Companies using AutoStore's System are reporting scratch rates of .01% which is roughly 1 unit scratched per 10,000 units shipped. In a non-automated warehouse, the vast majority of inventory discrepancies exist in pick slots. Most mistakes are made during the picking process, so bin-level accuracy is generally much lower in pick slots than in reserve slots used. For most companies with a WMS, inventory levels approach world class when they reach 99.7% and higher. With AutoStore, inventory errors are not eliminated completely because there is still a human interface and people can still pick the wrong quantity. Having said this, the inventory adjustment rates being reported from the field are so miniscule that they are almost irrelevant. Suffice to say that the level of inventory accuracy being achieved with AutoStore is as close to perfect that one can get in an operating environment that involves people. Lastly, AutoStore offers a high level of inventory security because the movement of inventory is directed to work stations that can be visually monitored. Humans never enter into the storage area where the bins are stored which further reduces the probability of shrinkage or damage. Safety - the probability that an operator may experience bodily harm because they are working in an industrial environment where man and machine are working together in the same space. With AutoStore, the human machine-interface is safe because the area that the robots work within is off limit to the operators. The human interface with the robots is also safe by design. Ergonomics - the amount of bending and stretching that a person must do to perform their job. As people get older, excessive bending and stretching can lead to injuries that result in higher rates of workman's compensation expense. In traditional warehouse operations there are ways to improve ergonomics, but there is no escaping the fact that order picking is a job that involves heavy lifting, reaching, bending and stretching. AutoStore work stations always present bins to operators at the perfect ergonomic position thereby eliminating all unnecessary bending and stretching. Noise level and cleanliness - distribution centers that are equipped with high volume conveyor systems tend to have the highest noise levels. Without the use of proper ear protection, operators that are exposed to loud conveyor systems for many years ultimately suffer significant hearing loss over time. AutoStore provides a perfectly clean and virtually silent operation. Fatigue factor - in a large distribution center, it is not unheard of for an order picker to walk over 20 miles per day on concrete floors and mezzanines. In smaller distribution centers where pick to belt systems are installed, many operators walk 3 - 5 miles over the course of a shift. With AutoStore, the operator works all day in a comfortable work station. This eliminates the need to walk on concrete floors which is physically demanding work that leaves people tired at the end of the day, especially if you are 50 or older. In many traditional distribution centers, a new associate is trained by an experienced associate and the expectation is that the new associate should be up and running within a 2 - 3 week time period. In distribution operations with engineered labor standards, the ability to reach the expected production standard can often require 6 weeks or more. Companies using AutoStore are reporting training times in the order of a few days because there is much less learning involved to perform the job of order picking. The operator does not need to learn a warehouse numbering system, the aisles where goods are stored, etc. They simply need to stand at a work station and look at the lights that tell them what to do. The work station is designed to remove the thinking element of the job, and to replace activity with productivity. Therein lies the reason why people are up and running within a few days. This is an especially important benefit to companies that need to scale their operation quickly, by adding new people, to meet the needs of peak season. No downtime and built-in redundancy. The worst nightmare of a distribution manager is the day during peak season when the conveyor system goes down. With a conveyor system, when something goes down, you don't ship orders. An alternative goods-to-man technology is the horizontal carousel. With this equipment, goods are stored in pods of carousels that bring the inventory to the operator. While the person picks from one pod, the other pods are spinning to bring the next pick facing forward. The carousel is an example of a serial technology because only one person can work at the picking function at any given point in time in the typical setup. The carousel can only output a certain throughput per shift based on the picking rate of the order selector. For example, if the picker works at 300 lines per hour then the carousel work station can only output 2,400 order lines per shift. The carousel also needs to be replenished so there is a downtime required during the day to restock the carousel pods. With AutoStore, the design is based on parallel processing rather than serial processing. Thus if at any time an operator at a work station needs to stop working, then the other work stations can continue processing orders. If at any time a robot goes down, then another redundant robot is there to take its place. Replenishing the bins with incoming inventory takes place concurrently with picking operations hence there is never any system shutdown required to enable restocking. At no time does the entire system go down which eliminates the high degree of risk that is associated with other mechanized or automated systems where there is a single point of failure that can prevent orders from being shipped. For any distributor seeking to increase market share by making a favorable impression on customers, deploying AutoStore provides a showcase distribution environment that is sure to instill confidence. Robots are relatively new to distribution centers but they are exciting to watch because they have relatively few moving parts and they are basically intelligent work horses. They have no need for breaks, sick days, vacations, health care premiums, etc. which is why we will be seeing more of these little creatures in the future. Where is AutoStore a Good Fit in a Distribution Center? Clearly, AutoStore has its limitations in terms of where one can deploy this type of technology. This is worth discussing since it is not a one-size-fits-all solution. To understand this point, we illustrate some examples below. AutoStore has a strong fit for distribution centers that process a high variety of split case SKUs such as in aftermarket parts distribution. Split case SKUs are generally items that customers do not purchase in full case quantities because: either the item is very costly and inventory assets are minimized by purchasing units instead of cases; or the SKU is slow moving and a full case is too long of an investment in inventory. Distribution centers that stock upwards of 10,000+ split case SKUs represent the best candidates for this type of technology. Many automotive aftermarket distribution centers carry well in excess of 100,000 SKUs, and there are some industrial parts distribution centers that carry in excess of 500,000 SKUs. These facilities tend to require an extensive amount of warehouse space and human resources to process orders because of the large surface area that needs to be traveled to store and retrieve inventory. These are the distribution operations that will benefit the most from AutoStore. It is important to note that the current weight constraint per bin is 65 lbs which means that heavier parts (e.g. car disc pads and brake rotors) may not be suitable for this application. Having said this, Swisslog is currently working to beef up the robots to handle bins weighing 120 Lbs. AutoStore has a strong fit for distribution centers where flexibility and scalability are strong requirements such as with Internet Retailers. Internet retailers are experiencing unpredictable surges in growth rates that cause their distribution operations to have to relocate to new facilities more frequently than companies that operate in mature markets. For Internet retailers, the attraction to AutoStore is that the system can be quickly and easily expanded to add more stacks, robots and work stations to support rapid growth or peak seasonal fluctuations in volume. The other major attraction is that AutoStore is easy to dismantle and reinstall into another building, which eliminates the business disruption associated with moving a major conveyor system. Electronic components distribution. This is clearly a target market for the AutoStore solution and indeed it was invented for this specific environment. To date, several success stories have emerged from electronics components distributors and it is easy to understand why this is the case. These operations handle tens of thousands of small parts that need to be stored in clean environments. AutoStore is the perfect application to minimize both the space and labor requirements for this profile of facility. Parts distribution. Distribution environments where there are 10,000+ parts to be held in storage where there generally is low to medium levels of activity are the ideal candidates for AutoStore, again because of the twin benefits of minimizing space and labor required for SKUs that tend to consume more than their fair share of resources. Any industry where there is a high variety of small / high value merchandise that needs to be handled accurately and securely. This could include, but is not limited to: Jewelry; high cost apparel and accessories; pharmaceuticals; medical devices; computer and telecommunications equipment; and even document storage. Grocery distribution - specifically for smaller nonfood Health and Beauty Care and General Merchandise SKUs. Many grocery retailers have distribution centers with 15,000 - 40,000 SKUs that belong in these categories. The most common approach is to deploy traditional multi-level pick to belt systems with case flow racks. These solutions are labor-intensive to replenish and problematic when there is an issue with the conveyance systems. AutoStore represents a viable alternative and the Asda U.K. installation will be closely watched by industry insiders. Retail and wholesale distribution. In addition to Internet direct to consumer retail, AutoStore provides a strong fit for many retailers that support stores with a high variety of split case SKUs. The most obvious examples are high volume office supplies and retail drug distribution centers. Other candidates include retailers specialized in pet supplies, hobby supplies, and any other high variety / small product application. E-commerce retail for companies that move apparel, footwear, and accessories to a combination of retail stores, retail accounts and consumers. Of course this is not limited to apparel companies and other high variety product lines that can fit into a tote certainly are candidates for this technology. We do not see AutoStore as being a good fit in any type of high volume full case or full pallet distribution environments. After reading this article, we hope that you have a better sense as to why a company would or would not invest into AutoStore technology. The benefits of the solution are plentiful in that it addresses all of the key areas that an automated material handling system needs to address - efficiency, accuracy, flexibility, scalability, ease of use, and quality of life. Most automated material handling systems lack flexibility and rapid scalability. Similarly, most automated systems are such that if the system goes down then you don't ship orders. We especially like the fact that AutoStore is a simple concept that enables parallel processing with built-in redundancy, since this eliminates the risk of not shipping orders due to a system failure. With all of its advantages, AutoStore is not a one-size-fits-all solution. For starters, the products being handled have to fit into the bins so this is a fundamental constraint. We have discussed our opinions as to where this technology is a good fit within the body of this article. We believe that this is a solution that best fits distribution operations that have a large variety of split case SKUs, a high degree of unit and/or inner pack picking, small order sizes, and a high amount of travel time required to fill customer orders. We see the AutoStore Solution as having a "best fit" for distribution centers that have in excess of 10,000 - 100,000+ parts in stock because the space and labor savings are unprecedented. AutoStore is also a critical aspect of achieving near perfect quality within the distribution center operation. Marc Wulfraat is the President of MWPVL International Inc. He can be reached at +(1) (514) 482-3572 Extension 100 or by clicking here. MWPVL International designs distribution centers and automated material handling systems and can help your firm evaluate if AutoStore is an appropriate solution for your distribution operation.